"With a clean and simplistic design template Minimal Slideshow allows FCPX users to create a stunning video with complete ease," said Christina Austin - CEO of Pixel Film Studios. 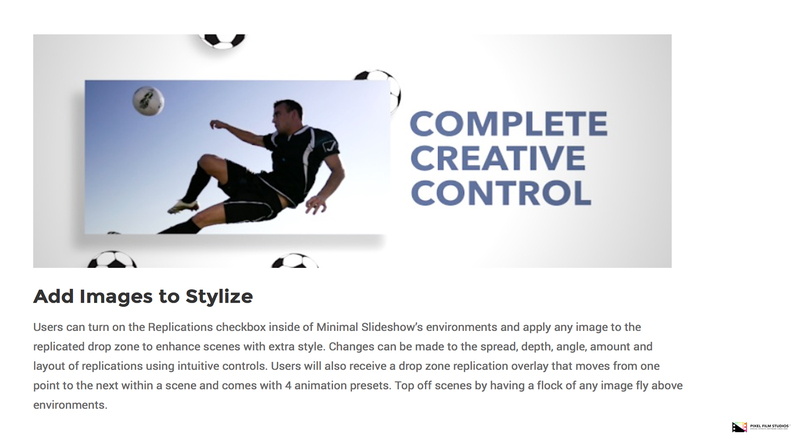 Start editing by using one of the many environment layouts included in the Minimal Slideshow package. Every preset contains a unique layout and/or animation setting so that users have a variety of looks to choose from right off the bat. Users can edit each preset infinitely and create their very own minimalistic layouts with ease. Minimal Slideshow’s environments come with on-screen controls so that users may reposition, scale and rotate the scene to achieve a desired look. 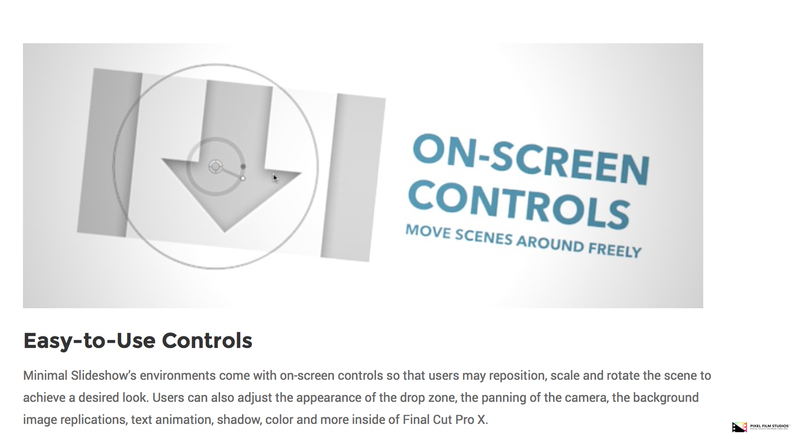 Users can also adjust the appearance of the drop zone, the panning of the camera, the background image replications, text animation, shadow, color and more inside of Final Cut Pro X. 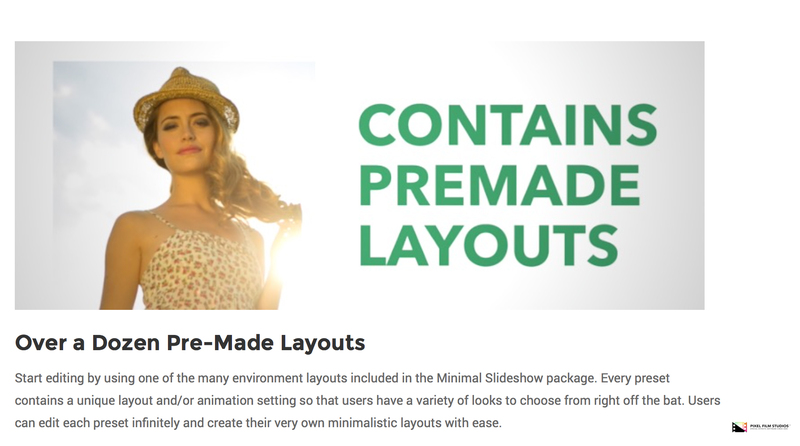 Minimal Slideshow comes with animating text layers that can be applied on top of environments for parallaxing looks, or used in any video to introduce people, places, concepts and more. All text animation presets can be animated into and out of the scene from all directions by choosing a direction from a drop-down menu. Presets with one to three lines of animation can be chosen and users can utilize on-screen controls to place text anywhere. 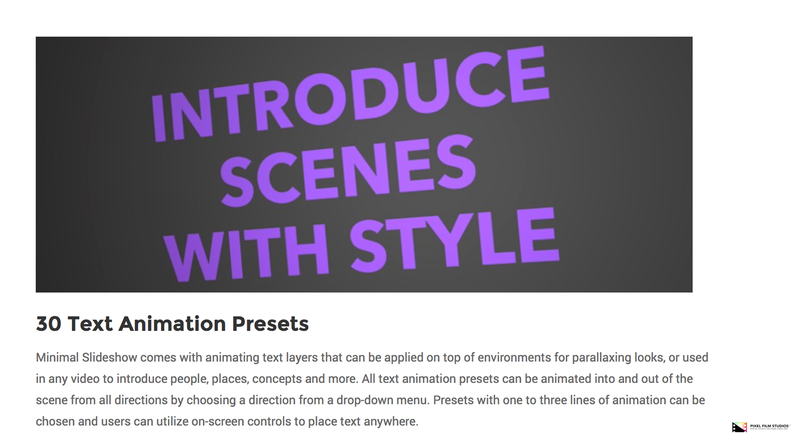 Scroll through the generated environments using one of the 4 scrolling transitions included in this package. To use, drop a transition in the gap between two clips. Choose to scroll to the left, right, down, or upwards and then watch as the transitions smoothly animate from one scene to the next. 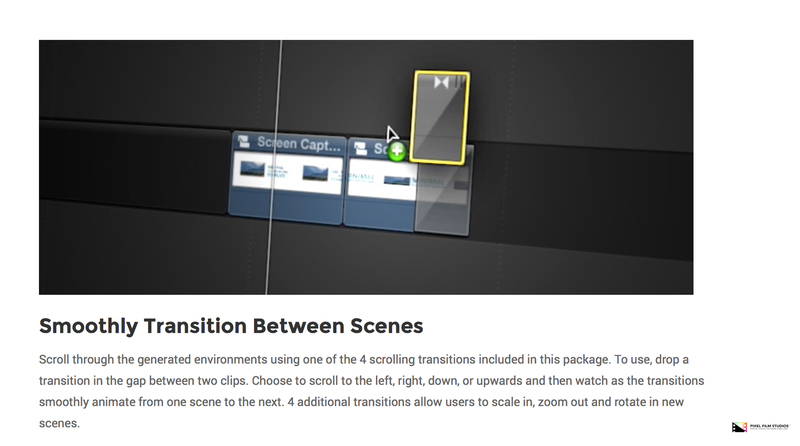 4 additional transitions allow users to scale in, zoom out and rotate in new scenes. Users can turn on the Replications checkbox inside of Minimal Slideshow’s environments and apply any image to the replicated drop zone to enhance scenes with extra style. Changes can be made to the spread, depth, angle, amount and layout of replications using intuitive controls. Users will also receive a drop zone replication overlay that moves from one point to the next within a scene and comes with 4 animation presets. Top off scenes by having a flock of any image fly above environments. Minimal Slideshow is made exclusively for FCPX.